The Kudu Classic, what a classic weekend! Thanks Jane and Taryn and all the Pringles! Every time I have driven to Cradock or Graaff Reinet I have looked longingly down the beautiful dirt road that climbs towards Tarkastad into the hazy blue mountains and have wanted to veer off the planned route to go and explore the promise of an adventure. And this weekend I got to do just that. 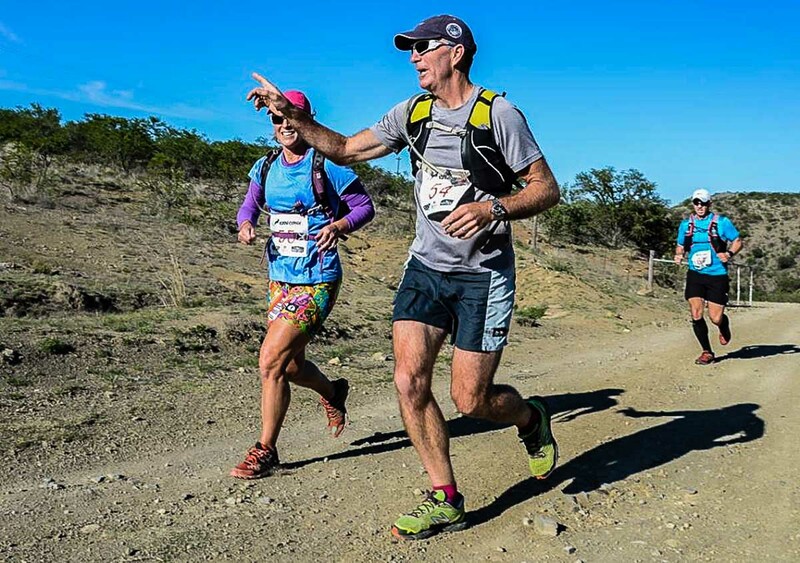 Pete and I booked and paid for the Kudu Classic in the middle of the year before I knew I was doing the Kalahari Augrabies Extreme Marathon the week before. I am so glad we did because it may well have been crossed off the list for not being a sensible choice in the light of what had preceded it. Sensible is boring anyway. So we set off on a road trip on Friday with Kerry Lynne, Noah and Eric (Pete’s younger brother) and with all the bantering and the discussion of race strategy (there is a lot of competition between the brothers) excitement levels began to reach fever pitch. We stopped for Kudu burgers and beers in Bedford (just to really get into the right frame of mind) and handed Eric over to his long-suffering wife, Ruth, with a tangible sense of relief. And then we turned off the tar onto the magical road of happiness and beauty and as the rest of the world became increasingly distant and cell phone signal melted away, the adventure began in earnest. The valley is populated almost entirely with 1820 Settler Pringles, who must have been very hardy and very prolific to have survived and thrived and populated this harsh place. The beautiful farmsteads are a testament to their tenacity. When we eventually turned into the oasis of Eilsdon Farm I was (briefly) at a loss for words. An astonishingly gracious church, Cape Dutch style farmhouse and rose garden surrounded by exquisite lawns and trees materialises like a vision. How is it even possible to create such a magnificent oasis of peace and beauty in the middle of such harsh terrain? It almost seemed out of place in its perfection. Just beyond the homestead and across a stream is a perfectly laid out tented village in an immaculate field. There is a sheep shed a short walk away, which has been transformed into a communal area for eating and drinking and race briefings. And the Pringles and their friends and relations and off-spring (like Rabbit in Winnie the Pooh) are everywhere and bubbling over with hospitality and enthusiasm to share their beautiful farm with us. The entrants seem to be made up largely of Wild Women and Soul Sisters and their partners and families and there are squeals of delighted excitement as a large reunion begins to unfold on the lawns. Most fabulous of all, my glorious running mates and herd members Kylie and Raj are here all the way from Cape Town just to ensure the ultimate pinnacle of happiness. And then, the food began to descend on the sheep shed and things are something of a blur from then on. OMG. How does one even begin to describe the gastronomic experience that is the Kudu Classic? How? HOW? The simultaneously crisp and succulent venison pie almost moved me to tears with its flavour…combined with all the most mind-blowing side dishes and roosterkoek and an indescribably exquisite dessert. Pete and I stumbled back to our tents with bellies as tight as drums. His belly button had altered with no warning from an “innie” to an “outie” from the sheer volume of the contents of his belly. There is no way that anyone could limit themselves to just 2 or 3 helpings. No way. How on earth was I going to run tomorrow? I would need days to digest this feast! I fell asleep one minute after my head touched my pillow, having managed the extra minute only because of the magnificence of the star studded sky visible through the air vent in my tent. We were all up at 5am in the crisp cool morning, hurtling around filling bladders and bottles and lathering ourselves with sunscreen before heading up to the shed for a 10 course gourmet breakfast of champions. How was anyone going to manage to run? Before 7am we were all loaded into the backs of bakkies and shuttled a couple of km’s up the valley to where the race started. (The Greater Kudu, 34km and the Lessor Kudu 18km). Oggie (Pringle, of course) brandished a handgun, fired a shot and we were off. And for the next 20km we climbed…and we climbed and we climbed. Fortunately, just at the point where we may have become grumpy from climbing the views were so mind-bogglingly beautiful that our good humour was immediately restored. Or Alice would come bounding along and join us for a while which had a similar effect. No-one can be grumpy around Ally. 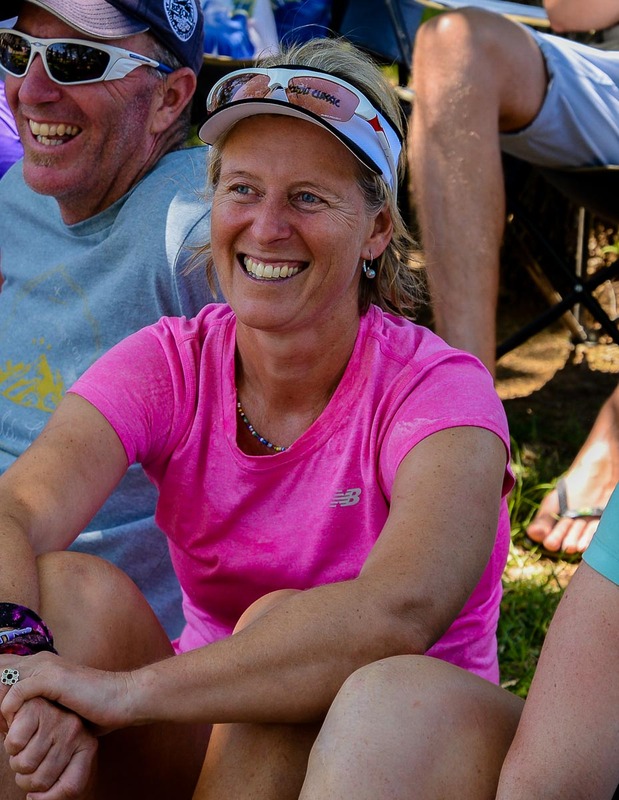 She has all the delightfulness and enthusiasm of a Labrador puppy and completely epitomises trail joy. What a legend! She was one of the highlights of our weekend and by Sunday we were all competing to adopt her. I was grateful to stop. What a luxury to spend the rest of the day lounging in the shade of the pear trees (we looked like an Impressionist painting, seriaas!) on the grassy riverbank surrounded by a whole bunch of my favourite people, with nothing to do but shoot the breeze, digest our fabulous lunch and watch Neville perform surgery on everyone’s blisters with a sheep syringe, a bottle of methylate and a singing roast chicken hat (really) borrowed from Kylie. It doesn’t get much better. I was weak with laughter from the endless swopping of snippets of race stories: “I kept needing an urgent pee before I could even get my shorts down and had to shout a 1 second warning to Josh to avert his eyes….she was on the brink of sitting down and refusing to continue so I shoved a banana muffin and 2 Panados in her mouth before she could even start negotiating and just kept going….He was starting to get all chirpy and springboard off of our despair after we saw the red roofs and he actually had the audacity to say that he was feeling good at one point! I just told him to shut it and he was less annoying after that and kept behind us…….he was complaining about blisters and I was expecting something impressive but there wasn’t even a mark on him! And I ran all the way down that hill to give him a plaster and a Myprodol and there was nothing even wrong with him! And then he kept saying the blister pain was moving all the way up his legs and he didn’t even have a f%£@*** blister!…Fatigue is just an emotion Eric, stop being so emotional! …But “Erectavite” can’t be a sport’s supplement?? There must be some other dodgy stuff in it? Like Rhino horn or something? ” As usual my laugh muscles were the most fatigued of them all! This is a race report, not a restaurant review, but I am simply unable to not mention Saturday Night’s dinner. I think there were an entire herd of sheep/lambs roasted on a spit together with baked butternut and baby beetroots, a salad that would have been the most glorious meal on its own, baby garlic potatoes, home made bread, chocolate mousse, malva pudding, home made ice cream and fresh cream. I had vowed that I would show more restraint than I had the previous night but I found myself making excuses to break my promise. Wow. I would go back just for the food and the hospitality, even if the running and general organisation wasn’t amazing (which it is). One of my evening highlights was a small feral Pringle boy dragging a smaller feral Pringle boy around all night by the foot and proclaiming him (the dragged) to be a dead sheep. The dragged was showing no dissatisfaction and seemed quite accepting of his role. Pete and I were feeling fairly shattered in the leg department by the end of day 1 and were anxious about having to get out of bed on Sunday and do another tough 30km. But I am always amazed at how quickly a good rest and good food can restore one. We were feeling 100% by the next morning. This was a good thing as the route and terrain on day 2 were certainly no easier than day 1. Imagine climbs that are a mix of Skyrun and Mavis Bank (the famous climb from the Rhodes Run). There was a roped section for heavens sake! We were literally dragging ourselves up the mountainside on our hands and knees wishing we had downscaled to the Lessor Kudu on day 2 as many of our mates had done. Our main motivator was the fact that we spent most of the day persistence hunting Eric. We knew that there was no need to pursue him with too much vigour; with enough patience and consistency he would come to us. Little glimpses of him getting closer and closer and anxiously checking our progress with furtive glances over his shoulder gave us an enormous amount of pleasure and incentive and we were delighted to catch him about 8km from the end. The last section of the run was spectacular and zigzagged along a beautiful riverbed (but without the sand!). I was amazed to hear that everyone was finding it stiflingly hot; it felt like a mild spring day to me after a week in the Kalahari but apparently was measured to be 38’. 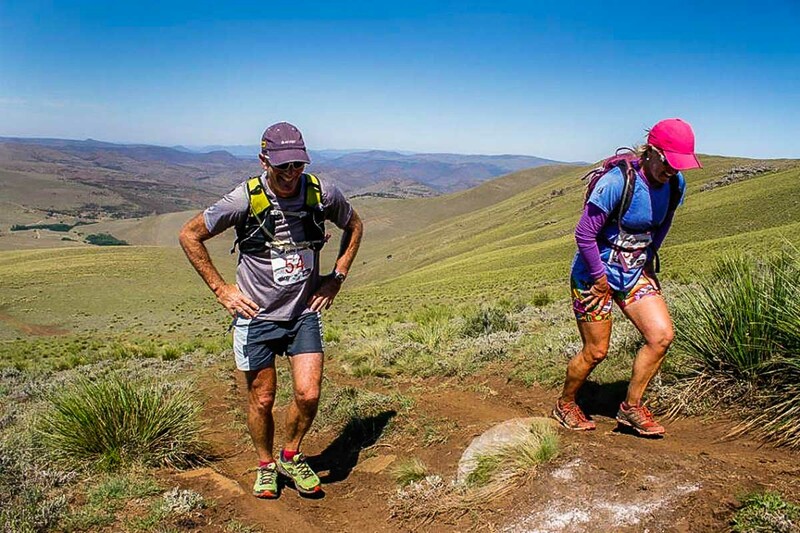 Pete and I have never run a trail race together, let alone a stage race (although we have done some adventure racing as a team) and we weren’t entirely certain how we would operate as a running couple. I loved running with him and it felt very evenly matched, we are going to have to stop saying that he isn’t really a runner. I think he has graduated to true running status in the last 12 months. The entire weekend felt like a tonic and seemed much longer than 2 days. All that remained was the hilarious prize giving (with feral kids and a massive Great Dane, Charles, milling around and increasing the fabulousness of the whole occasion). I was elated to win a cheese as big as my head as my prize for being the 2nd lady home. And then there was just one more spectacular meal to consume (kudu burgers, we had come full circle!) before we reluctantly began the journey home. What a classic event. There is no way I am ever missing it in the future. This is the Eastern Cape at its very best.